Serving the townships of Salem, Hamilton, Harlan, and the southern half of Washington. For the Love of Chocolate! This past Monday, the library hosted its second annual "For the Love of Chocolate" contest. Participants were asked to create one chocolate dessert for the judges, three local businesswomen, who would score the desserts on five criteria: taste, texture, appearance, originality, and complexity. After much deliberation (and thirteen scrumptious entries) the judges made their decisions. First place went to Emily McCracken and her Chocolate Ganache Cake; second place went to Lynn Norman for her Chocolate Bonbons; while third place went to Peyton Pakozdi for her Oreo Cake. Afterward Jim Revelos, of Esther Price Candy, gave a presentation about the history of the company, as well as featuring a short video in which the candy making process of the local sweets company was shown. Needless to say, it was a night of entertainment and decadence. Visit our Facebook page today to see photos of the winners, the desserts, and more! "It's an epic of a novel that spans 50+ years and follows three generations of a Greek-American family. Our narrator, Calliope (or Cal), takes us on a journey, spilling family secrets long-ado hidden from everyone. Remarkably funny for the subject matter; gut-wrenching at times. Whether or not you agree with Cal's decisions, you can't help but root for him. A book you can set down and pick back up time and again, you won't be able to forget what happen no matter how long you've been away from it. You'll want to read it straight through!" "I was born twice: first, as a baby girl, on a remarkably smogless Detroit day of January 1960; and then again, as a teenage boy, in an emergency room near Petoskey, Michigan, in August of l974. . . My birth certificate lists my name as Calliope Helen Stephanides. My most recent driver’s license...records my first name simply as Cal." So begins the breathtaking story of Calliope Stephanides and three generations of the Greek-American Stephanides family who travel from a tiny village overlooking Mount Olympus in Asia Minor to Prohibition-era Detroit, witnessing its glory days as the Motor City, and the race riots of 1967, before they move out to the tree-lined streets of suburban Grosse Pointe, Michigan. To understand why Calliope is not like other girls, she has to uncover a guilty family secret and the astonishing genetic history that turns Callie into Cal, one of the most audacious and wondrous narrators in contemporary fiction. 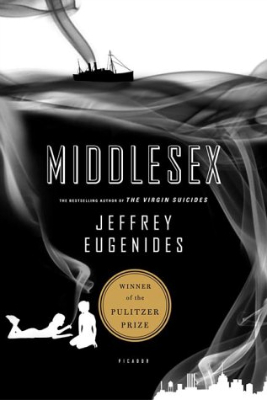 Lyrical and thrilling, Middlesex is an exhilarating reinvention of the American epic. Middlesex is the winner of the 2003 Pulitzer Prize for Fiction. I Want To Go To Morrow...Today!